It all starts and ends with........FAMILY! : Jayson is home from the DUNES! Jayson is home from the DUNES! Jayson is home form his GUY trip to the sand dunes. Thank Goodness!!! So I will share my secret confession..... that I am not as supportive as I could be when it comes to him and four wheeling. It truly scares me to death that someone will get hurt.... like him or the kids. 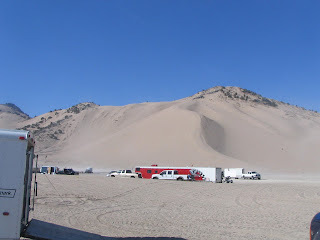 The sand dunes especially scare me, with there own personal Life Flight that is there each day. He is always trying so hard to get me to like, or show the least bit of interest for his love and passion of 4 wheeling. I have to admit I have zero interest. He has offered to buy me any wheeler, just for me to go with him. I think he is desperate for me to like it. I keep telling him I don't need or want anymore in the garage, plus it scares me. He goes to some crazy places!!! He may just have to keep brain washing Baylee and Gavyn to love 4 wheeling, because I don't know if it will happen for me. I do have to say that the kids love it....it is so cute to see them have so much fun riding and spending time together with DAD. He keeps telling me some of his fondest memories as a child were 4wheeling. He is trying to build those same memories with his kids. Back to the confession, I tend to turn in to an ornery BEAST each time he leaves for a 4 wheeling trip. I miss him so much for starters, they are major money pits(the truck, the trailer, the jets,you know all that stuff), I am a little on the jealous side....that he gets to go have fun with out me, and last, but not least...I become a nervous wreck when I can't get a hold of him and my mind starts to wander and I fear the worst. I pray each time he makes it home in one piece, because I couldn't stand it if something ever happened. I have decided to try to be a little more supportive of his hobby and hope to be a better wife at letting him go and have some fun. He definitely deserves it! He works so hard, and I know he needs fun and breaks from life too!!!!! Just not EVERY weekend. I am going to give it another shot at learning to like the sport, he is already planning some family 4 wheeling trips with other friends. Lets hope I can like it for his sake.... (his dream is a wife that loves to 4 wheel)! Any way, to make a long story short, He blew me off my feet this weekend with a new car as a surprise while he was gone. I cried in excitement, and because of thoughts that he would do that for me. All I could think about was how I wished he were there to share in my excitement. He thought it would be more exciting that way. Needless to say I felt super guilty for being a beast about the 4 wheeling trip. He is such a special guy and I love him so much. I definitely think he deserves a few good moments and enjoyment, doing what he loves best. I am sure he will get more kitchen passes (in his words), as long as he promises me he will be extra careful and will come back safe and sound. What a special guy! I absolutely love him to pieces, and THANK him for all the little things he does for me, and our little family. I couldn't ask for any better than him. He means the world to me and I would be lost with out him. I am glad you have so much fun four wheeling!!!!! Him unloading the trailer from the trip. 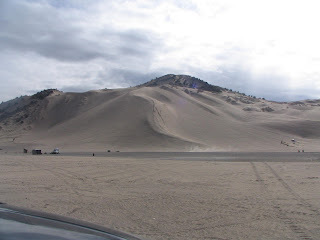 The Sand Dunes...... This may be Sand Mountain. The big one that I keep hearing about. Maybe not, but it looks Scary to me!!!!!! The latest purchase. This one we will just call #5. I think this is the one that he let his brother ride. They all had fun, but were extremely sore and tired the next day. ALL in all I think he had a great time. It amazes me how excited he gets over sports, and his dang four wheelers!!!!! Looks like The Boys had fun! 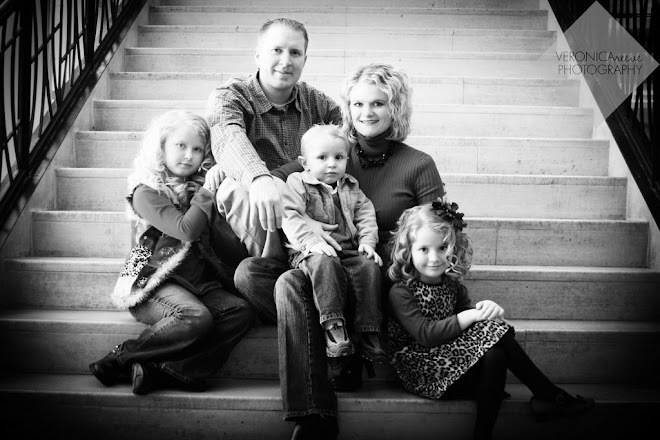 It is hard to to let our spouses and kids go somewhere with out us. It's also hard for me to go somewhere with out them. But...it's also nice to have a minute to miss them, because it makes me want to just spend all the more time with them when I or they get back! It also reminds me why I love them so dang much! How fun, what is your new car?? And I totally thought I commented on your easter pics, but I guess I didn't! They are super cute! All dressed up in their best! Mine are all grubby!!! And we were in St. George, so no, not close to you guys! I might be coming this weekend for conference with my mom, dad and sis. It would just be Sat and Sun and I have a baby blessing on Sat and fam dinner on Sun then fly home, so what are you up to and we can see if we could meet up for a second!? The Dunes were fun thanks for taking me! Next weeks vegas drags will be fun too, I can wait! I ment to put can't wait! Oh Melissa, you are such a nice wife!! I don't know if I'd be able to let B go to the dunes, maybe if he upped his life insurance a few million.....maybe. When B goes out of town the girls and I do a lot of shopping, eating take-out, and girly stuff. We have to try and make it fun, cause we miss him so much! 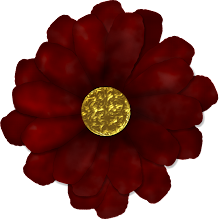 Absence sure does make the heart grow fonder. A new car huh? details please! Funny thing is...accidents at the sand dunes paid for my new car too! I'm just playin with ya! Boys will be boys, and B does plenty of dangerous guy things too, what do ya do? Your preaching to the choir girl!! Cam is also obsessed with the dunes, his dirt bike, 4 wheeler and jeep!! Hello, I hope he makes it to the age of 40! 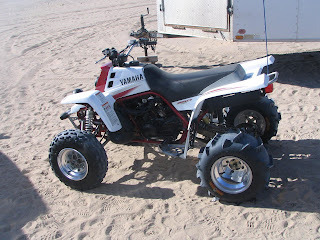 I don't get too excited about it either, but one weekend we went to Dumont Dunes in Cali and we rode around a little and I did have fun, but I am kinda a true believer that it is just a guy thing. Tag loves it too, so I am happy that they can have fun together. 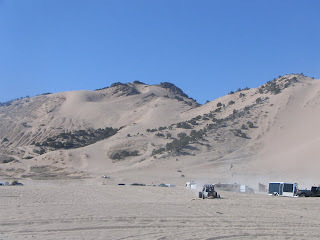 We live so close (10 minutes) from the Sand Hollow sand dunes and Cam goes riding once a week- we also go on several Saturdays becuase there is a lake there and it is a lot of fun. If you ever need to escape the cold (like right now-~) load up the toys and come on down. The guys would love it and we would at the very least get a good tan! Hope all is well!